Happy birthday bull market! The longest running bull market in United States history hit a major milestone last week, turning 10 on March 9. It sure has been an interesting and exciting 10 years. US equities, as measured by the S&P 500 Index, found their footing on March 9, 2009 while the US and the world were in the throes of the Great Recession. Since then, the S&P 500 has produced a total return of approximately 396% and an average annualized return of approximately 17.3%. But, the ride higher hasn’t always been smooth. Consider, since March 2009 we’ve contended with four corrections of 13%+, US government shutdowns, a US debt downgrade, the European debt crisis, Brexit, the Arab Spring, the risk of an armed conflict on the Korean Peninsula, and a budding trade war with China. Yet even with all of that, the S&P 500 sits at 2743 – up from its open price of 675 on March 9, 2009 – and the US economy is growing 2.5%. Proof positive the economy tends to expand, and risk assets tend to increase in value. And, to that point, we think the market will remain on a successful quest for greater gains. After all, US equities are reasonably valued, earnings are growing, inflation is contained, monetary policy isn’t restrictive, and investment sentiment isn’t ebullient. We remain optimistic on US stocks into 2019, though we do expect a volatile trading environment. People need no help picturing equity return volatility. Anyone invested in the equity market in the middle 2000s still likely feels the scars from the subprime mortgage crisis. Prior to that, there was the dot com burst of the early 2000s. The dark side of equity return volatility is double-digit loses in a short period of time that can take years to recover. It is for that reason equity investing is best for time horizons that are also double-digit in years. However fixed income volatility is more subtle in nature and although people know to try to avoid it, it is not as widely understood. Volatility for investments is often represented by the standard deviation which most understand has to do with the range of returns that are experienced around the average return. However, knowing the term and understanding what the term represents are two separate matters. Volatility in traditional fixed income securities is driven by the two factors: changes in the rates that securities of similar risk should pay and how long you are locked into receiving the coupon rate of a given security. The magnitude these market rates changes impact the principal value of the fixed income instrument is driven by how long an investor is locked into a given rate as the duration of a bond. Accordingly, the fear of rising raters has driven investors to try to lower the duration of the bonds they own to lower the price hit or even to avoid fixed income securities. One thing that differs between equity and fixed income volatility is what happens with returns after there is a downward movement in price. When an equity goes down in value it is likely due to the consensus judged future prospects of the equity having gone down. For a fixed income, as long as the future ability of the instrument has not come into serious question, the short-term hit comes due to the market view of rates required for payments having increased. In other words, equities go down because things have gotten worse while for fixed income prices go down because the market feels you should be paid a higher rate going forward. As way of example, consider a diversified portfolio of bonds like that represented by a Bloomberg Barclays US Aggregate Bond replicating investment like the iShares US Aggregate Bond ETF (AGG) or the Vanguard Total Bond ETF (BND). Currently, the duration is about 6 and the 30-Day SEC Yield is about 3%. If rates rise by 0.5%, these securities will take about a 3% price hit (not precisely due to convexity but close enough). Going forward the SEC Yield should rise as bonds now are lower priced but pay the same coupon amount and new bonds are bought with higher coupons. The income return on a new dollar invested is now expected to be over 3% but a 3% hit was taken on the principal amount invested. Despite the feared rate hike occurring, the net return is still projected flat or maybe even slightly positive for the 12-month period. Another way to picture this return volatility, we can look at the actual annualized 36-month, 84-month, and 120-month rolling periods for the Bloomberg Barclays US Aggregate and Russell 3000 Index since the start of 1994, 25 years ago. During this period there existed no 36 month period where Bloomberg Barclays US Aggregate failed to deliver a positive absolute return and as increasingly longer periods are looked at the range of actual outcomes settles into a 3% to 8% range. Alternatively, equity still possesses a few very unlucky 120-month (10-year) periods with a negative return as well as periods of annualized returns in excess of 14%. It is for this reason that longer time horizons are prescribed for equity investing and time horizons of 3+ years are regarded as reasonable for holding a diversified fixed income exposure. Finally, it would not be an investment blog if it was not pointed out that these extreme return periods often occur at different times for different asset classes and intelligent diversification gives better return range confidence. Better investment return confidence leads to increased ability to plan and better planning usually leads to better outcomes. 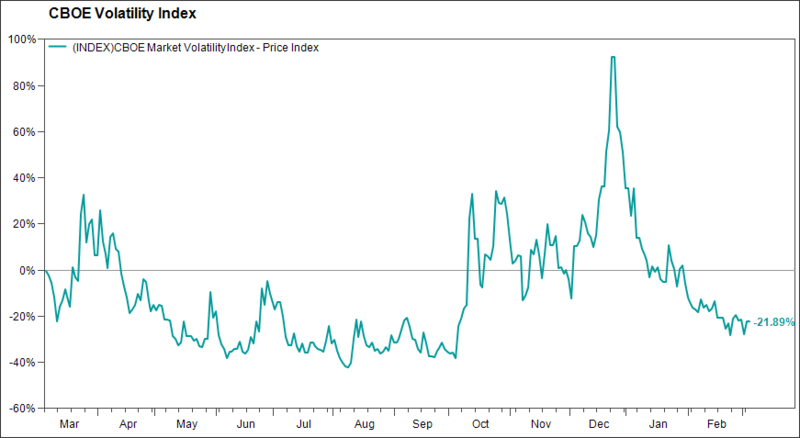 More than once last summer, we were asked our thoughts on the early 2018 spike, and subsequent drop, in market volatility as measured by the VIX, Wall Street’s “Fear Index.” We noted we weren’t surprised by the return of volatility, an accelerating economy and rising rates were expected catalysts, nor its departure. We also believed volatility would be back, and back it was in the fourth quarter, before it vanished again. Given the rather volatile behavior of late – well, market volatility – we thought now was a good time to touch base on the topic. 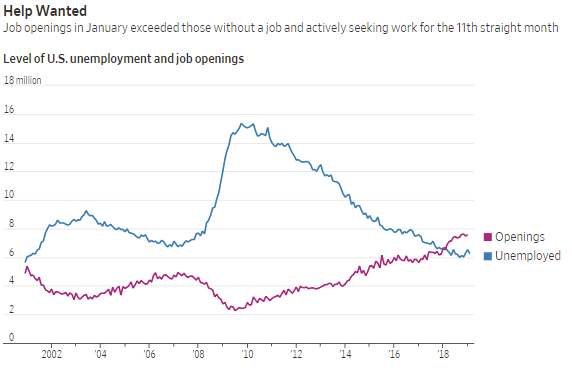 To back up, in early 2018 the VIX spiked to 40 and the S&P 500 Index sold off sharply on a January jobs report that showed greater than expected wage inflation. While the economy and the market welcome modest inflation, an ever-present concern is accelerating inflation that forces the Federal Reserve (Fed) to raise interest rates aggressively, ultimately pushing the economy into a recession and stocks into a bear market. When there was little inflationary follow through post the January jobs report, and economic and earning reports continued to top expectations, volatility declined sharply and the market rallied strongly. That is until Q4 as investors grew concerned the Fed would raise rates and shrink its balance sheet more than economic and market conditions merited, and the US and China would enter a full blow trade war, the VIX spiked and stocks corrected. Then, as the Fed walked back its hawkish talk on rates and its balance sheet, and we received more good news than bad on the state of US/China trade negotiations and economic data came in largely as expected, the VIX peaked and the S&P 500 bottomed in late December. Since late December, the VIX has collapsed 23 points and the S&P 500 has rallied 19% – see the below chart for a look at volatility through 2018 and into 2019. While we welcome the move higher in the S&P 500 and the decline in the VIX, we doubt we have seen the last of market volatility, with potential catalysts including better than expected economic growth and US/China trade relations. However, a bumpy market isn’t a bear market, and as long as fiscal policy and monetary policy remain accommodative, and inflation contained, US equities should be biased higher. Bell bottoms we can dig. But a V bottom we can REALLY dig. We can’t comprehend why the ‘70s remain such a maligned decade. Sure, there was Watergate and Stagflation and a host of other national ills, but there was also disco, Welcome Back Kotter, and bell bottoms. And as we wait on the overdue return of bell bottoms to a position of fashion prominence, our attention turns to a more important, and potentially more timely, bottom – a V bottom in the stock market. As discussed in prior blog posts, one prism through which investors can view both the market and capital allocation is technical analysis, which said simply, is the effort to ascertain future return patterns for risk assets based on prior return patterns. As such, technicians pay close attention to factors such as price momentum and moving averages, including whether the security or index of interest is trading above or below said average, which could be the point of price support or price resistance. Yes, technical analysis can be confusing! So, when the S&P 500 Index sold off nearly 20% last year (see black line in chart below), many technicians predicted grim days ahead for the market as the benchmark for US equities was both trading meaningfully below its 50 day and 200 day moving averages (see green and red lines, respectively, below) and markets rarely experience a V bottom – a sharp correction followed by a short rebound. In technical parlance, the market needed time to repair the damage done to it during the late 2018 pullback. Well, with the S&P 500 rallying 19% off its December low, we may just be in the midst of that often discussed, but seldom seen V bottom. And, while Brinker Capital does consider short-term technical factors such as momentum when making our asset allocation decisions, see the Brinker Capital Market Barometer below, we believe it is economic fundamentals, interest rates, and earnings that drive equities over the longer term, and on those fronts, we still see more good news than bad. To say it was cold in January might qualify as the understatement of the year, akin to something like the Patriots are a pretty good football team – full disclosure, I am NOT a Patriots fan. Indeed, January saw us all introduced to the dreaded Polar Vortex and minus 50-degree days in the upper Midwest. But while we were all freezing, the US stock market was on fire with the Dow Jones Industrial Average, the S&P 500 Index, and the NASDAQ – and just about every other broad-based US equity benchmark – up meaningfully in January. In fact, the S&P 500’s 7.9% return in January marked the Index’s best January since 1987. A time in our recent past when the Patriots were definitely not dominating the NFL. So, what’s behind the market’s great start to the year? And, what might it portend for the rest of 2019? We don’t think it was one thing that put the market on firmer footing, but several factors including a more dovish Federal Reserve, a more constructive tone to US/China trade negotiations, a better than expected US jobs’ report for December, and a Q4 earnings season that has contained more good news than bad. Also, during the December market sell-off, investor sentiment went very negative and US equity-facing strategies experienced significant outflows, so the stage was set for a meaningful bounce if we got positive fundamental news, which we did. We continue to believe if we solve for monetary policy risk and trade policy risk, the US economy and market should both do well this year. Which brings us to one of the great Wall Street adages, “As January goes, so goes the year,” which speaks to the idea that how the market does in January has often been indicative of how it does for the full year. In fact, since 1950 the full year performance of the S&P 500 has mirrored its January performance (for good or for ill) 58 out of 68 years or 85% of the time. Now, no one knows why this pattern persists, and it hasn’t always held – last year is an example of that- but let’s hope that for 2019, as January goes, so goes the year.